Gwydir Forest Park is home to the celebrated landscapes of lakes, forests and mountains to the generations of visitors who have walked the woodland paths and fished the clear waters of the Conwy, Llugwy, Lledr and Machno rivers since Victorian times. Gwydir Forest ranges across the hills on Snowdonia's eastern flank. High wooded ramparts rise steeply from the level pastures of the Conwy valley, enfolding Betws-y-Coed, and creating a dramatic setting for the town of Llanrwst and nearby Gwydir castle. Above and beyond the valley slopes lies an extensive, rolling upland of wooded knolls, lakes and pastures, which stretches to the jagged Clogwyn-yr- Eryr ridge above Llyn Crafnant, and to the dominant outline of Moel Siabod. Lead and zinc mining dominated the area between 1850 and 1919. The legacy of old engine-houses, waste tips and reservoirs are characteristic features of the forest landscape today and several of the most important mines have been partially restored and made safe for visitors. 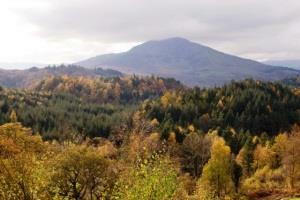 Gwydir Forest now extends over 7,250 ha, including 4,900 ha of productive woodland. Gwydir attracts thousands of visitors who walk the paths, study wildlife, cycle, climb, fish, orienteer, or merely enjoy the calm of these timeless woodlands. Tracks, old miners’ paths, cycle trails and long-established forest walks make this forest a delight to explore. You can get full details of all the waymarked routes in this app. Accessible toilets at Llyn Geirionydd and Crafnant car parks.